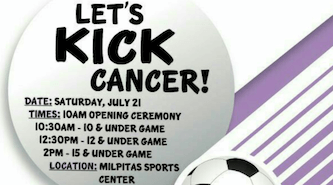 Check out this local community event “Let’s Kick Cancer!” It’s a family fun event for all ages on Saturday, July 21st at the Milpitas Sports Center. There will be three soccer games for different ages (under 10, under 12 and under 15), carnival-style games, food, raffle prizes and more! If you are unable to attend, but would like to support Milpitas Kicks Cancer and the American Cancer Society, please make a donation here. Like us on Facebook and follow us on Twitter to learn more about community events!